Is that a QWERTY in your pocket? The Psion-sized PC is back, in the form of an Atom-based pocket computer. The return is thanks to two names familiar to the Epoc community - former Psion employee Paul Pinnock of Croydon repair shop POS Ltd, and broadcaster Ewan Spence, an editor at AllAboutSymbian. Or as we still fondly think of it, AllAboutER6. The first offering from the new company, the Psi)(pda (easier written and pronounced as PsiXpda), is certainly Psion-sized, if not quite the legendary form factor. It's a slide-up, rather than a fold-out "spectacle case" hinge - so the keyboard isn't quite of the Psion vintage - it looks like the WinCE Psion knock-offs, or the larger Nokia Communicators. 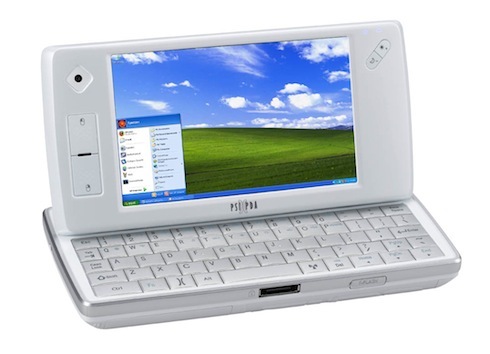 The PsiXpda runs Windows XP, but it's open for hacking, the company stresses. So Linux and Android, and perhaps even Symbian, may soon be running. There's no doubting its compact credentials. The device packs an Atom processor, a 1850mAH battery, 1GB RAM and an 800x480 screen into a 174mm x 84mm x 25mm device, weighing 430g. The Series 5MX checked in at 168mm x 90mm x 23mm and weighed 360g, including the two AA batteries. So it's heavier than the 5MX or 3MX (275g) but smaller in two planes. The compactness comes at a premium: the device will retail for around £500. Pinnock acquired the old Psion plant machinery at the end of the 1990s. 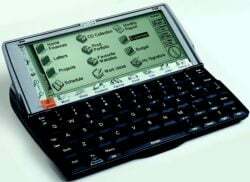 After Psion withdrew from the consumer electronics market in 2001, Pinnock and former POS employee Ewan hoped to resume manufacturing Revos as replacements for the then substantial Psion market. The two almost snared a PalmOS licence for the hardware. Now that the laptop is cheap and ubiquitous, it's hard to see a shirt-pocket computer being quite as popular. But then again, nothing on the market today offers touch typing, and instant on, in such a compact and convenient package. Instant on means instant off, which makes it a much more social device than a laptop. And the software of today - email, social networking, IM, Twittering - demands a good keyboard. Something ought to cater to this market: social hardware for social software. Update: It does look like a rebadged Asian UMPC, the EKing S515. Stand down.